Microsoft has again changed name of its web based email service. 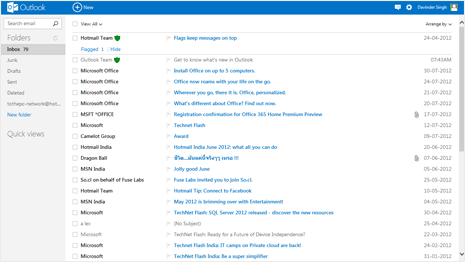 Latest Microsoft’s email offering come in the form of “Outlook” branding with look and feel of metro interface as seen in upcoming Windows 8 operating system. New look ‘Outlook.com’ email service is definitely very impressive at first glance. All existing users with @hotmail.com or @msn.com or @live.com email IDs can upgrade to new Outlook.com email service. While other users can simply create new account at Outlook.com website. 1. Open login.live.com website (or simply Outlook.com) and then login using account details of your existing @hotmail.com or @msn.com or @live.com email address. 2. Once you login successfully, click Upgrade in the options menu of Hotmail. After upgrade, everything should work like before as your email address, password, contacts, old email and rules will remain unchange. Also you can send and receive emails from your @hotmail.com or @msn.com or @live.com address. Above is the preview of new Hotmail’s inbox. It has very neat interface without too much clutter. User interface is quick to load and focus remain on email messages in this new deisgn. 1. You can easily rename your exisiting @hotmail.com or @msn.com or @live.com email address to @Outlook.com ID. Just follow this URL (https://g.live.com/9wc9en-in/w_letter6) and you should see following screen for renaming your exisiting email account. 2. Your new @Outlook.com email address will work like old one and you can choose to keep your old mail in a separate folder. All other associated services like Contacts, Photos, Office, SkyeDrive will switch to new @Outlook.com email ID automatically within few days. 1. If you do not have exisiting Microsoft account for either of Hotmail, Live, Xbox, Windows Phone – then you can create new @Outlook email account to check out all new Outlook email service. 2. Open Outlook.com website and click Sign Up button. Quickly fill the email account creation form to test drive new modern email service from Microsoft. 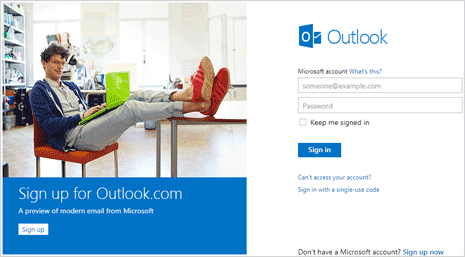 Now you can only create new (Microsoft email) account with @Outlook.com email ID. Options to create new email ID with @live or @msn or @hotmail is not available now. How to open Bing search without background image?